Does the person collecting the signatures have to live in the Aldermanic/School Board District or in the City (for citywide positions)? Does my campaign office space need to be in the Aldermanic/School Board District for which I am seeking election? Does my treasurer have to live in the Aldermanic/School Board District for which I am seeking election? Do I have to live in that Aldermanic/School Board District in order to run for the office? 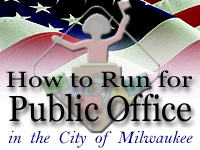 Can I continue to work as a city employee and run for office? If a person owns a business in a particular Aldermanic/School Board District, but does not live in that district, can the owner still sign the nomination petition? Do I, as the candidate, have to turn in my nomination petition forms? Are the mayoral, aldermanic and School Board races partisan or non-partisan? How many signatures are required on the nomination petitions in order to seek a City of Milwaukee elected position? Do I have to wait until the nomination filing deadline to turn in my petition signatures and other forms? No, the person collecting the signatures, the circulator, no longer needs to reside in the Aldermanic/School Board District or jurisdiction (city) in which the paper or petition was circulated, or reside in the State of Wisconsin. This new policy was adopted by the State Elections Board on May 21, 2003. No, you may have your campaign office wherever you choose. No, the treasurer's residence is not regulated. A person declaring candidacy (submitting their Declaration of Candidacy) must be a qualified elector* of the city of Milwaukee for 10 consecutive days as of the date they are filng the Declaration of Candidacy. *A qualified elector is defined in Wis. Stat. § 6.02 as a U.S. citizen, 18 years of age or older, who has resided in the election district for at least 10 consecutive days before any election at which he or she offers to vote (and who is not disqualified by virtue of one or more of the impediments described in Wis. Stat. § 6.03). No, only persons residing in the Aldermanic/School Board District may sign the nomination petition. Dropping off the nomination petition forms does not necessarily have to be done by the candidate; someone else can drop them off. However, the candidate is responsible for the accuracy and completeness of all forms submitted on his or her behalf. All elections for city office are non-partisan, meaning candidates do not have to declare a political party in order to run for office. No, you may turn in the forms as soon as they are complete. Candidates are encouraged not to wait until the deadline.